Like most other gels, Muir Energy Gel is very high in simple sugars ranging from 50% all the way as high as 83%. e-Gel is loaded with complex carbs, very little sugar and balanced electrolyte replacement for proven real world results (read our customer stories below). To top it off, Muir Energy Gel is more than double the price of e-Gel. Muir Energy Gel contains betwen 50% and 83% simple sugar (depending on the flavor), while e-Gel only contains 18% (all flavors). We use the same base formulation of high complex carbs and low sugars that has proven to work for our customers (see customer stories below). 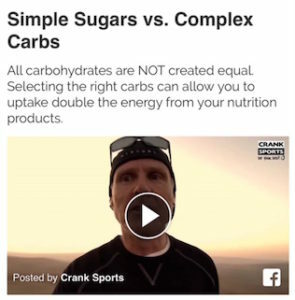 Complex carbs are well documented to provide more absorbable energy than simple sugars as explained in this short video. Sodium in particular is critical to maintain hydration and to avoid cramping and injuries. e-Gel has over double the amount of sodium compared to Muir Energy Gel, and is designed to meet the American College of Sports Medicine’s recommendations. Amino acids help to reduce lactic acid build up, maintain muscle protein and aid in recovery. Muir Energy Gel has no Amino Acids. Muir Energy Gel has no citrates.